This article is about the creature. For the NPCs of the same name, see Soul. Souls are the souls of mortal cows that have been trapped by soul gems. 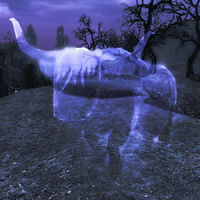 There are two which inhabit the Soul Cairn, appearing as ghostly versions of regular cows. This page was last modified on 25 November 2016, at 03:00.